The following speech was given by Fidel Castro on 8 October 1987 at the main ceremony marking the twentieth anniversary of Guevara’s death. It was held at a newly completed electronics components factory in the city of Pinar del Río. Nearly twenty years ago, on October 18, 1967, we met in the Plaza of the Revolution with a huge crown to honor Compañero Ernesto Che Guevara, Those were very bitter, very difficult days as when we received news of the developments in Vado del Yeso, in the Yuro Ravine, when news agencies reported Che had fallen in battle. It didn’t take long to realize that those reports were absolutely correct, for they consisted of news items and photos that proved it beyond doubt. For several days, the news was coming until with all that information in hand — although many of the details we know today were not known at the time — we held the large mass rally, the solemn ceremony in which we paid our last respects to fallen compañero. Nearly twenty years have passed since then, and now, on October 8, we are marking the date he fell in battle. According to reliable reports we have now, he was actually murdered the following day after having been captured unarmed and wounded; his weapon had been rendered useless in battle. That’s why it has become a tradition to commemorate that dramatic event on October 8. The first year passed and then five, ten, fifteen, now twenty years, and it was necessary to recall the historic dimensions of that development, and particularly the man. Thus in a natural way, rather than a very deliberate or pondered way, the entire people have been recalling the date in recent months. It was possible to commemorate the twentieth anniversary on a solemn note as we have seen here today: The playing of taps, the anthem, the magnificent poem by Nicolás Guillén, which rang out with the same voice we heard twenty years ago. I could try to give a very solemn, grandiloquent speech, perhaps a written speech, but in these times the pressure of work barely leaves a minute free for thinking more carefully about all those events and the things I could say here, let alone for writing a speech — that’s why I’d prefer to recall Che, share my thoughts with you, because I’ve thought a lot about Che. I did an interview, part of which was made public yesterday in our country, in answer to the questions of an Italian journalist who had me in front of the television cameras nearly sixteen hours straight — actually, they were movie, not TV cameras, because in order to get a better image in everything he did, he didn’t use videocassettes, some of which last two hours, but rather movie cameras. He’d change reels every twenty or twenty-five minutes, and so it was quite an exhausting interview. We should have taken three days to do to do it, but we had to do it in one because there was no more time. We started before noon on a Sunday and finished at 5:00 a.m. the following day. There were more that 100 questions. Among the variety of subjects and themes, the journalist was very interested in talking about Che, and between 3:00 and 4:00 a.m. we got to the subject. I made an effort to answer each of his questions, and I made a special effort to summarize my memories of Che. I told him how I felt, and I think many compañeros feel the same way, regarding Che’s permanent presence. We must keep in the special relationship with Che, the affection, the fraternal bonds of comradeship, the united struggle over nearly twelve years, from the moment we met in Mexico until the end, a period rich in historic events, some of which have been made public only in the last couple of days. It was a period filled with heroic and glorious deeds, from the time Che joined us to go on the Granma expedition, the landing, the setbacks, the most difficult days, the resumption of the struggle in the mountains, rebuilding an army virtually from scratch, the first clashes, and the last battles. Then the intense period that followed, one after another, such as the start of imperialist hostility; the blockade; the slander campaigns against the revolution as soon as we started to do justice to the criminals and thugs who had murdered thousands of our fellow citizens; the economic blockade; the Girón [Bay of Pigs] invasion; the proclamation of the socialist nature of the revolution; the struggle against the mercenaries; the October [missile] crisis; the first steps in the construction of socialism when there was nothing — neither experience nor cadres nor engineers nor economists and hardly any technicians, when we were left almost without doctors because 3,000 of the 6,000 doctors in the country left. Then came the First and Second Declarations of Havana, the start of the isolation imposed on our country, the collective rupture of diplomatic relations by all Latin American governments except Mexico. It was a period in which, along with all these developments, we had to organize the economy of the country. It was a relatively brief but fruitful period replete with unforgettable events. It must be kept in mind that Che persisted in an old desire, an old idea: to return to South America, to his country, to make the revolution based on the experience he’d gained in our country. We should recall the clandestine way in which his departure had to be organized, the barrage of slanders against the revolution when there was talk of conflicts, of differences with Che, that Che had disappeared. It was even said the he had been murdered because of splits in the ranks of the revolution. Meanwhile, the revolution calmly and firmly endured the ferocious attack, because over and above the irritation and the bitterness caused by those campaigns, the important thing was for Che to be able to fulfill his goals; the important thing was to ensure his safety and that of the compatriots with him on his historic missions. In the interview I explained the origin of that idea, how when he joined us he had set only one condition: that once the revolution was made, when he wanted to return to South America he would not be prevented from doing so for reason of state or for the state’s convenience, that he would not be held back. We told him he could go ahead and that we would support him. He would remind us of this pledge every so often until the time came he decided it was time to leave. Not only did we keep the promise of agreeing to his departure, but we gave him all the help we could. We tried to delay the departure a little. We gave him other tasks to enrich his guerrilla experience, and we tried to create a minimum of conditions so that he would not have go through the most difficult stage of the first days of organizing a guerrilla force, something we knew full well from our own experience. We were well aware of Che’s talent, his experience and his role. He was a cadre suited to major strategic tasks and we felt it might be better if other compañeros undertook the initial organizational work and that he join at a more advanced stage in the process. This also fit in with our policy during the war of saving cadres, as they distinguished themselves, for increasingly important and strategic assignments. We did not have many experienced cadres, and as they distinguished themselves we would not send them out every day with a squad to ambush; rather, we gave them more important tasks in keeping with their ability and experience. 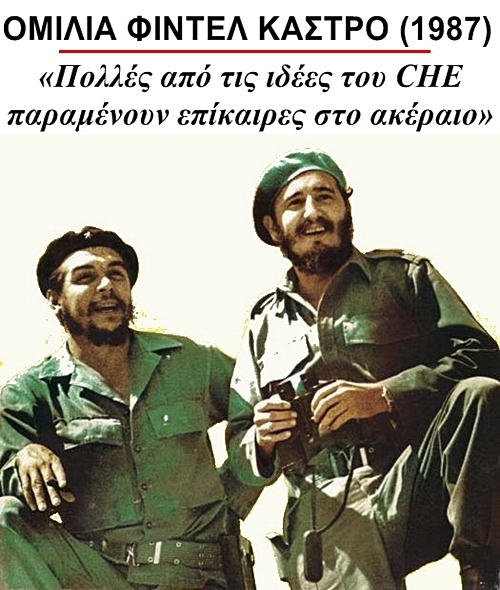 Δημοσιεύθηκε την Οκτώβριος 9, 1967 Μαρτίου 4, 2014 από GuevaristasPosted in Ernesto Che Guevara,Ιστορικοί λόγοιΜε ετικέτα Cuba,Ernesto Che Guevara,Fidel Castro.